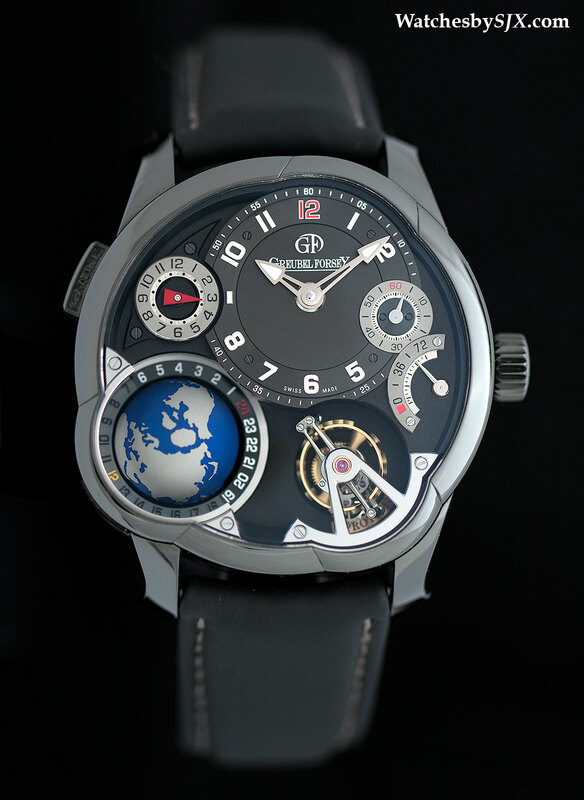 Greubel Forsey stuck to its founding principles, concentrating on exotic tourbillons of exquisite quality – notably with a negligible concession to affordability in the form of a new entry level wristwatch, the Tourbillon 24 Secondes Vision. 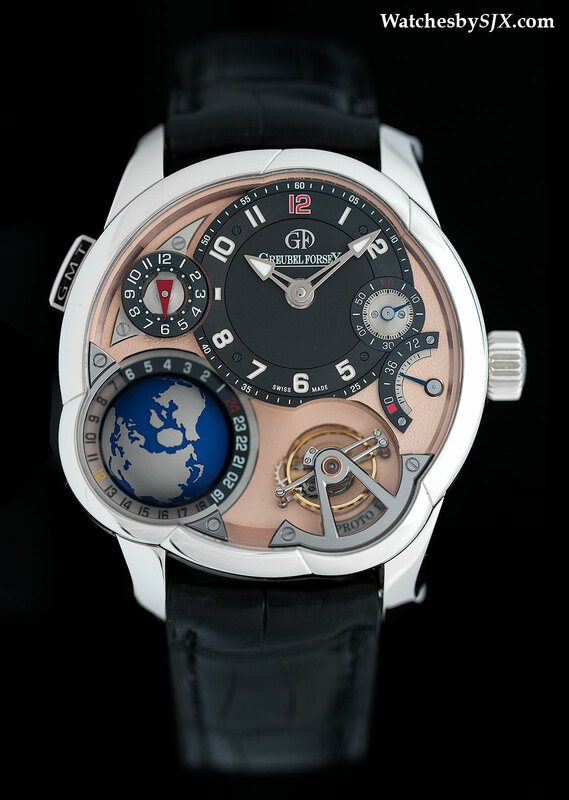 Greubel Forsey presented its most affordable tourbillon ever at SIHH 2015, the Tourbillon 24 Secondes Vision. Such might be interpreted as a sign of the slow luxury watch market, but the Tourbillon 24 Secondes Vision still costs 290,000 Swiss francs, only 10% less than the next model up the scale. Despite, or because of, the modestly reduced price, the Tourbillon 24 Secondes Vision is still as magnificently conceived as any other Greubel Forsey. 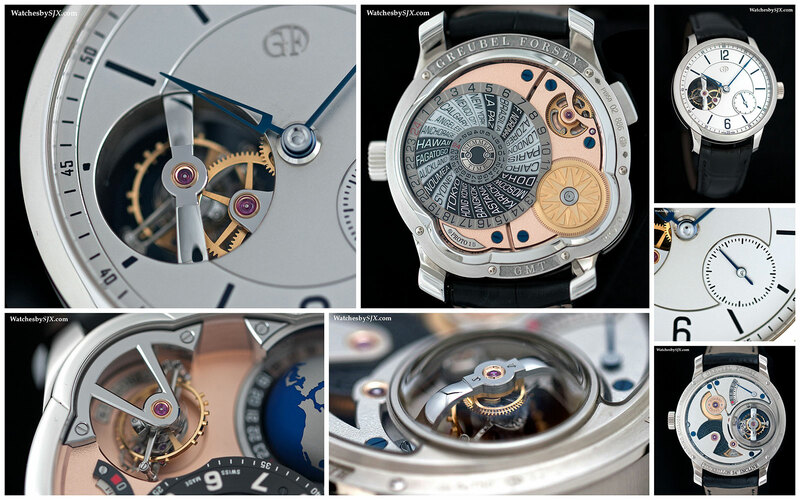 At 43 mm in diameter, the Tourbillon 24 Secondes Vision is the smallest watch offered by Greubel Forsey. 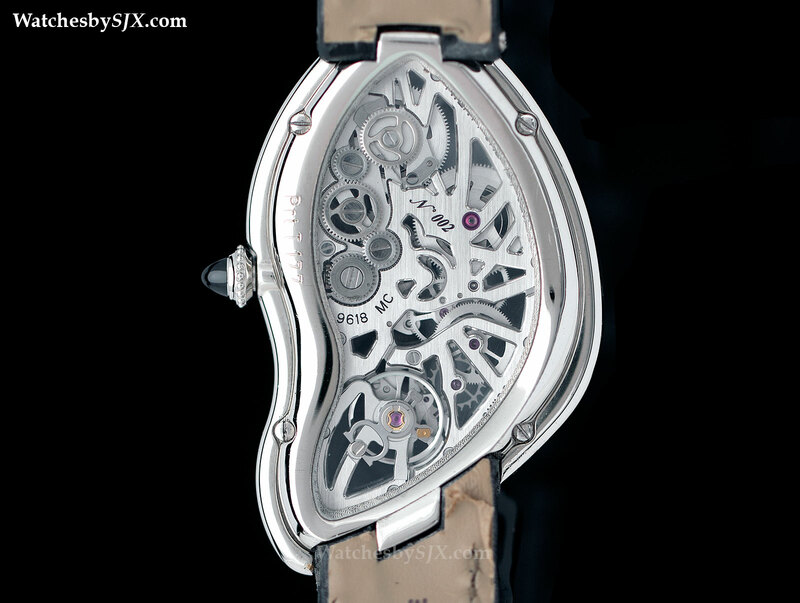 And it is also the slimmest, lacking the case bulge that characterises so many of its watches. 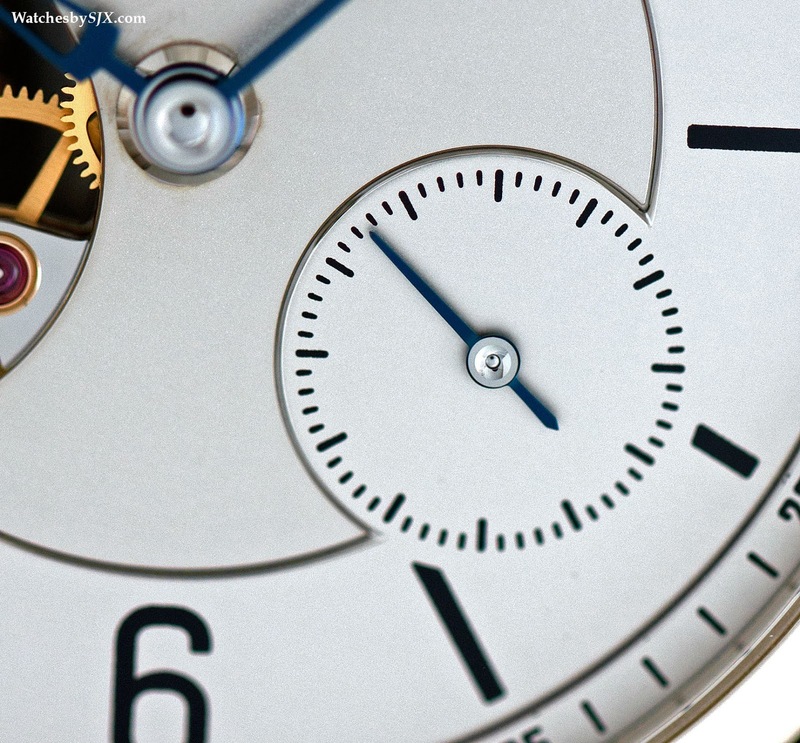 The dial is appropriately simple, almost to the point of being plain. 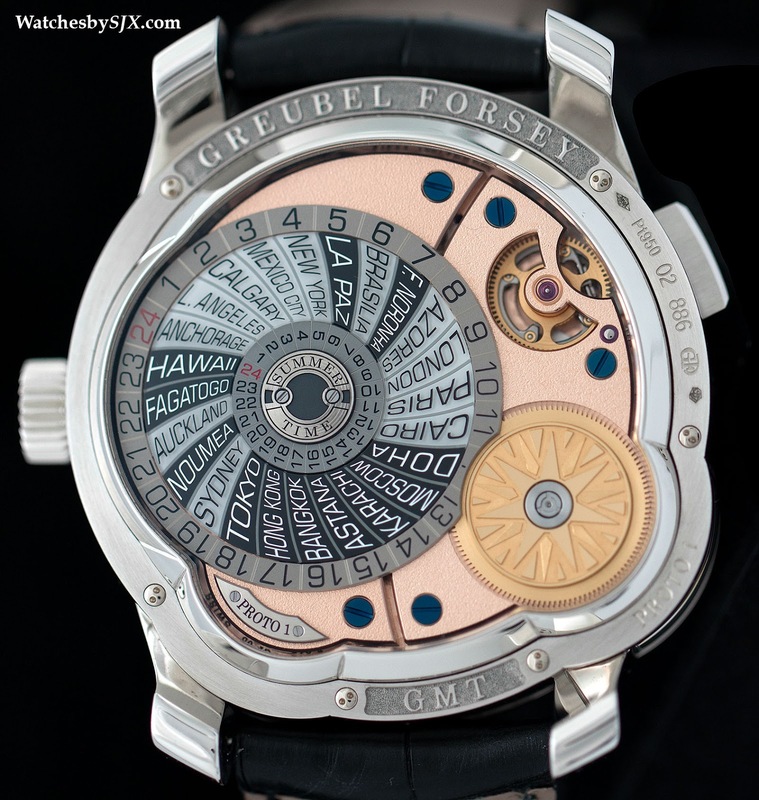 But as is Greubel Forsey’s habit, everything is executed elaborately and expensively. 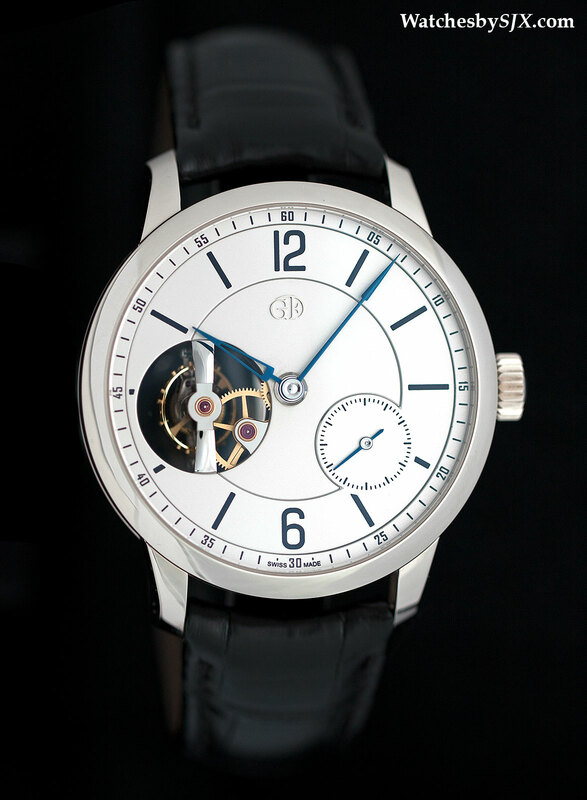 The dial is a disc of silvered, 18-ct gold, with engraved numerals and markings that are then filled with enamel and fired. Such champlevé enamel dial markings were common on top-end watches in times gone by, they are fade-resistant and last forever. 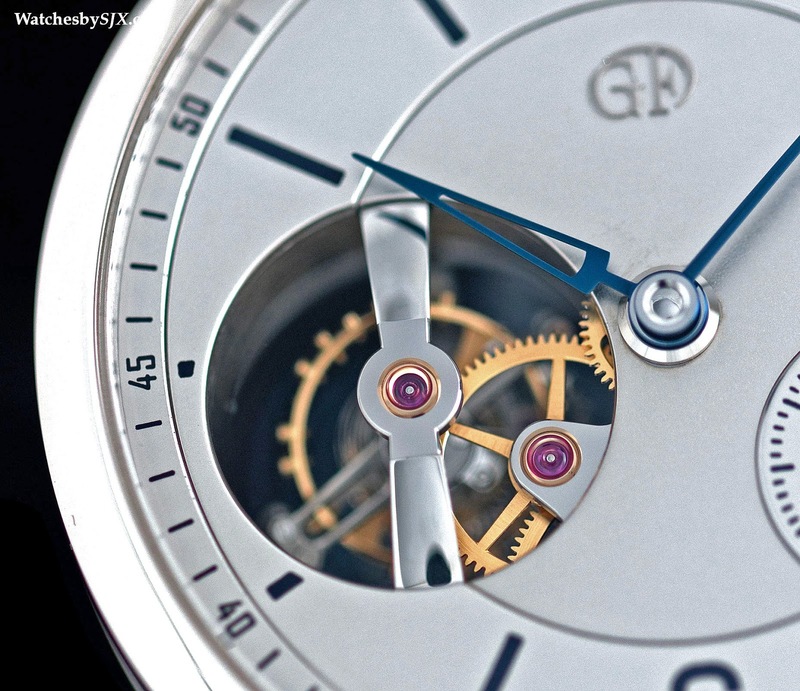 The movement is also decorated in typical Greubel Forsey style, with a sapphire bubble in the back to accommodate tourbillon. 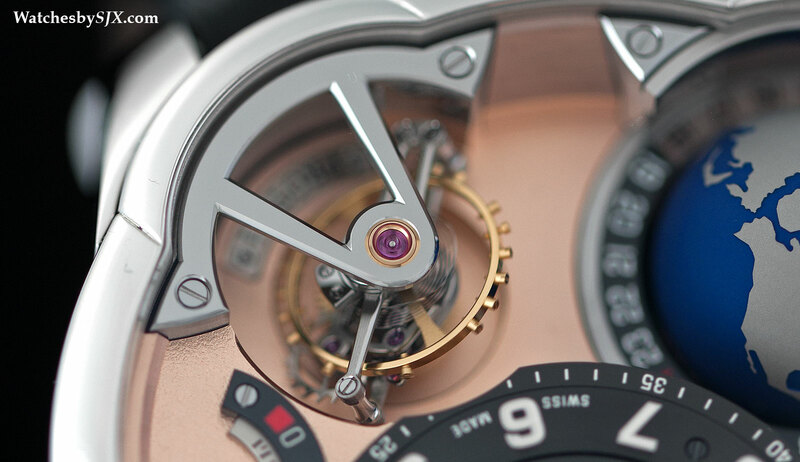 Mechanically the movement is very similar to that on the current, and more expensive, Tourbillon 24 Secondes. 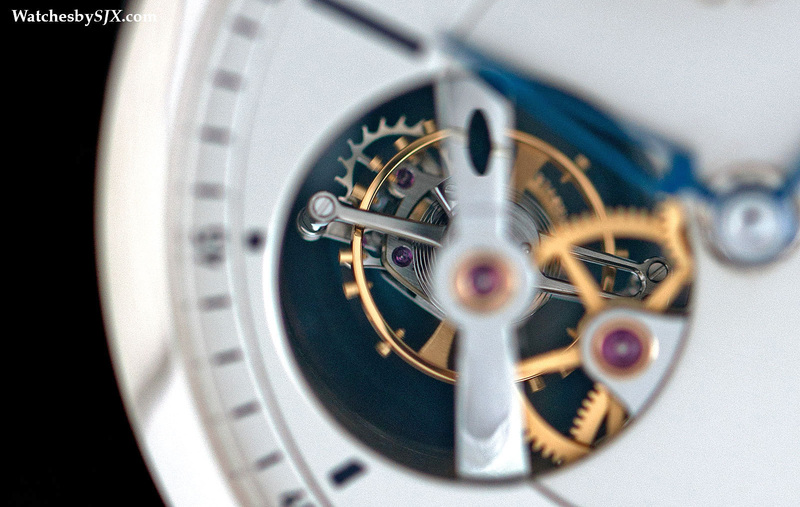 It features a tourbillon inclined at 25 degrees that rotates at a brisk 24 seconds per revolution. And it is limited to 22 pieces in white gold. 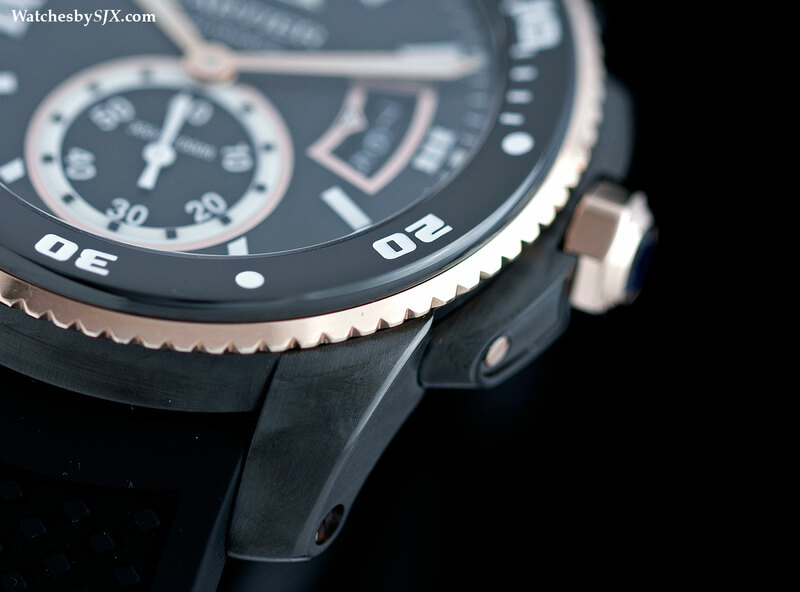 Two new versions of the GMT were also introduced. 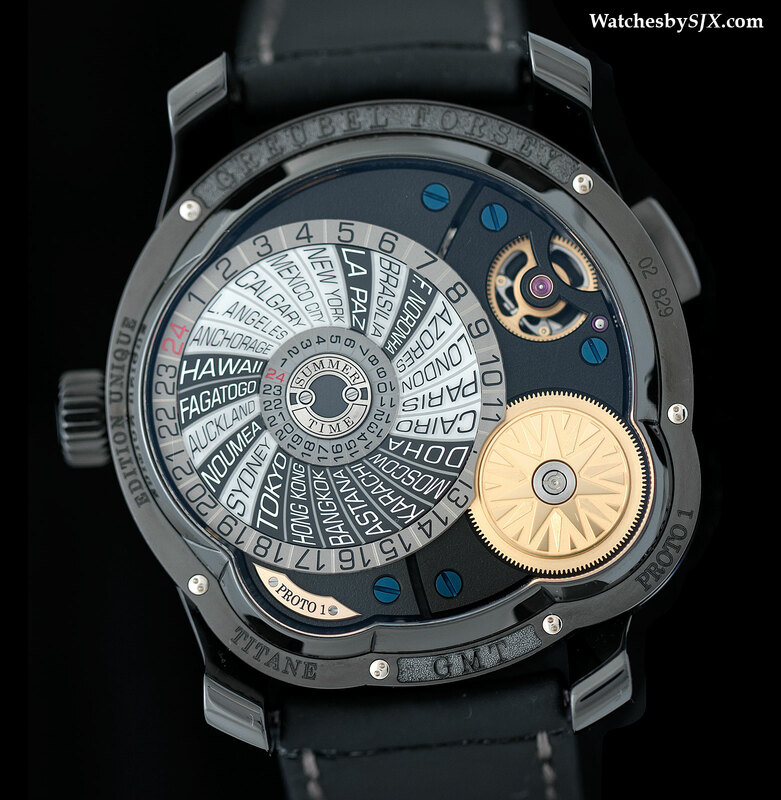 The private jet set now have the choice of a diamond-like carbon (DLC) coated titanium case (US$565,000), or in platinum with a frosted gilt dial (about US$660,000). Both are limited to just 22 pieces. Functionally these are identical to the existing GMT models, with a second time zone on the front along with a day and night indicator in the form of a globe, while a cities disc on the back indicates the time around the world. The colour combination of the new platinum GMT was actually inspired by the Invention Piece tourbillons, which also combined a white metal case with a gilt dial. 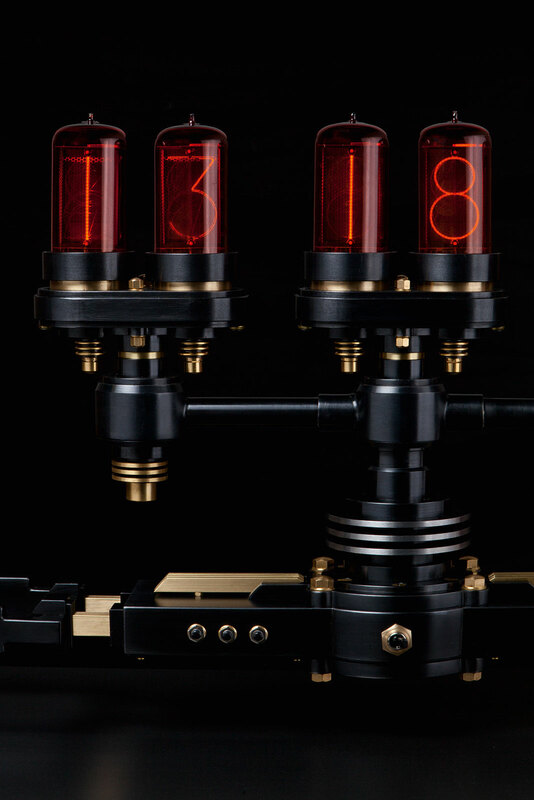 The final watch revealed at SIHH is actually a work in progress. 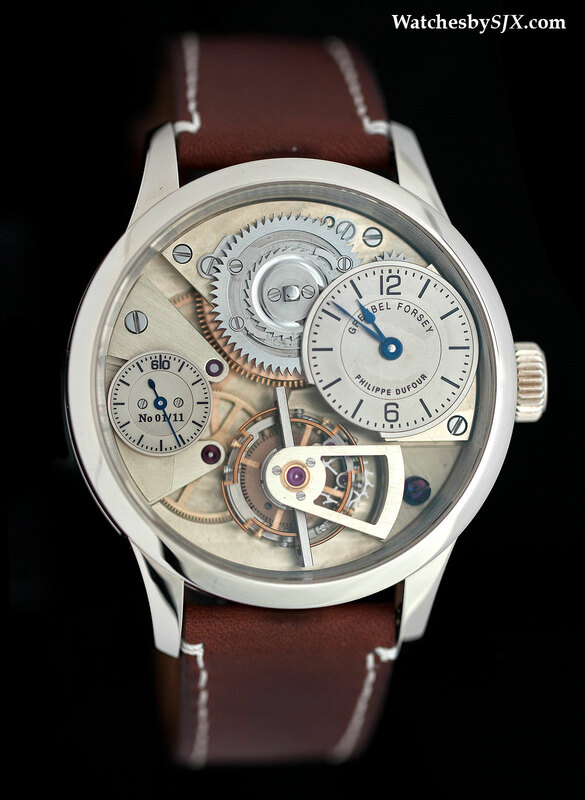 A working prototype of the Naissance d’une Montre, the result of Le Garde Temps, a collaboration between Greubel Forsey and Philippe Dufour. 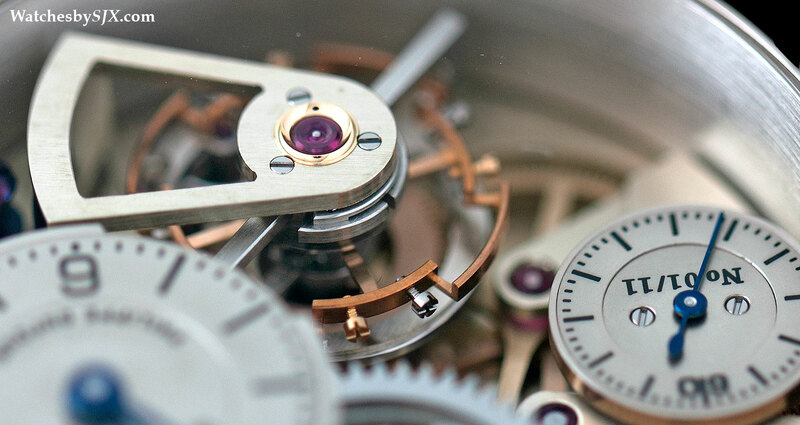 The goal of the project is to teach a French watchmaker, Michel Boulanger, the skills necessary to manufacture and finish a timepiece the traditional way, meaning no electronic equipment. 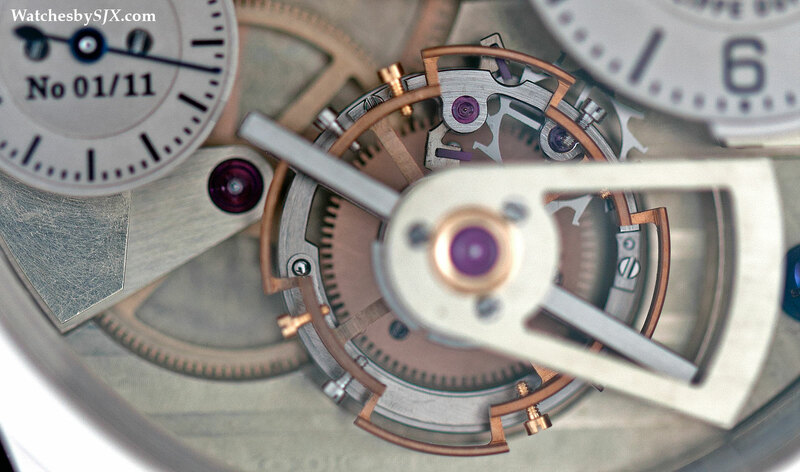 Once complete, Boulanger will return to the watchmaking school where he teaches to impart those skills on to the next generation of horologists. 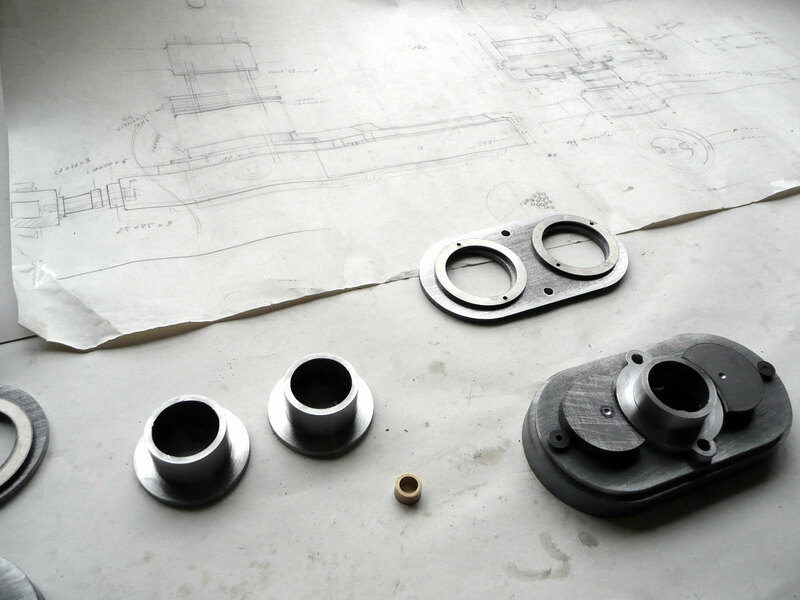 As the photos indicate, the prototype is some way from being completed, but the wristwatch is promising. 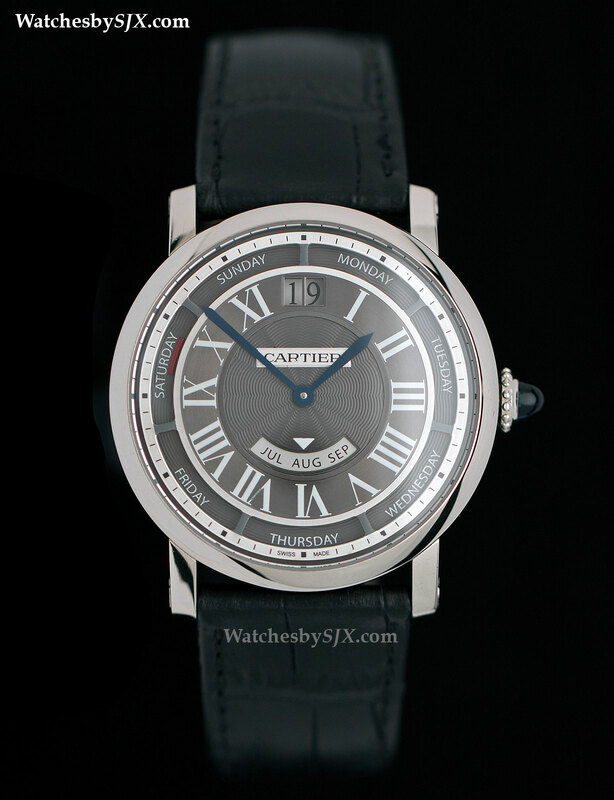 Cartier covered the spectrum of watchmaking at SIHH 2015, ranging from its most complicated wristwatch ever, all the way to a brand new, entry-level model, the Clé de Cartier – and everything in between. 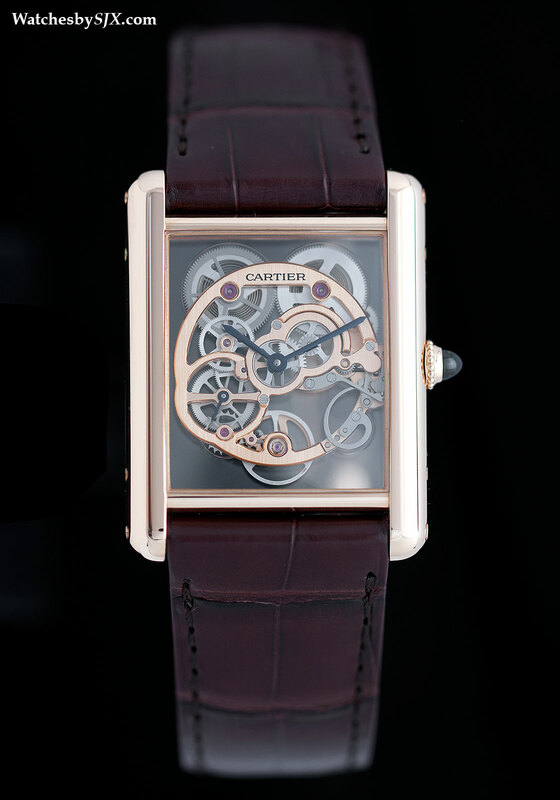 Every year Cartier unveils the widest range of timepieces at SIHH 2015, being one of the largest watch brands globally. 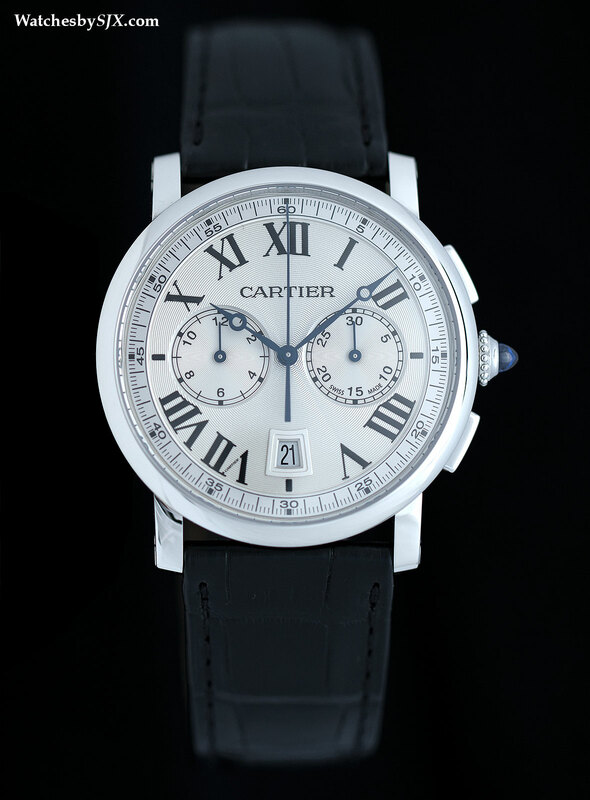 Despite the more subdued mood this year, the breadth of the line-up was no different, though the introduction of entry-level models like the Clé de Cartier and Rotonde de Cartier Chronograph demonstrate an awareness of market realities. The collection had something for everyone, including those with €600,000 to spare for the Rotonde de Cartier Grand Complication. 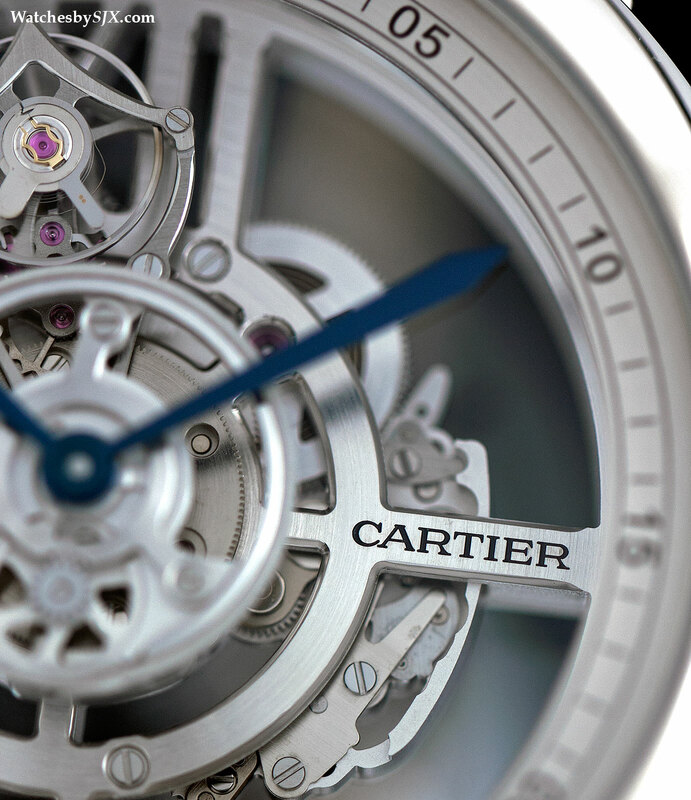 Equipped with a minute repeater, perpetual calendar and tourbillon, the Rotonde de Cartier Grand Complication was developed in-house and is the most complicated wristwatch Cartier has ever made. 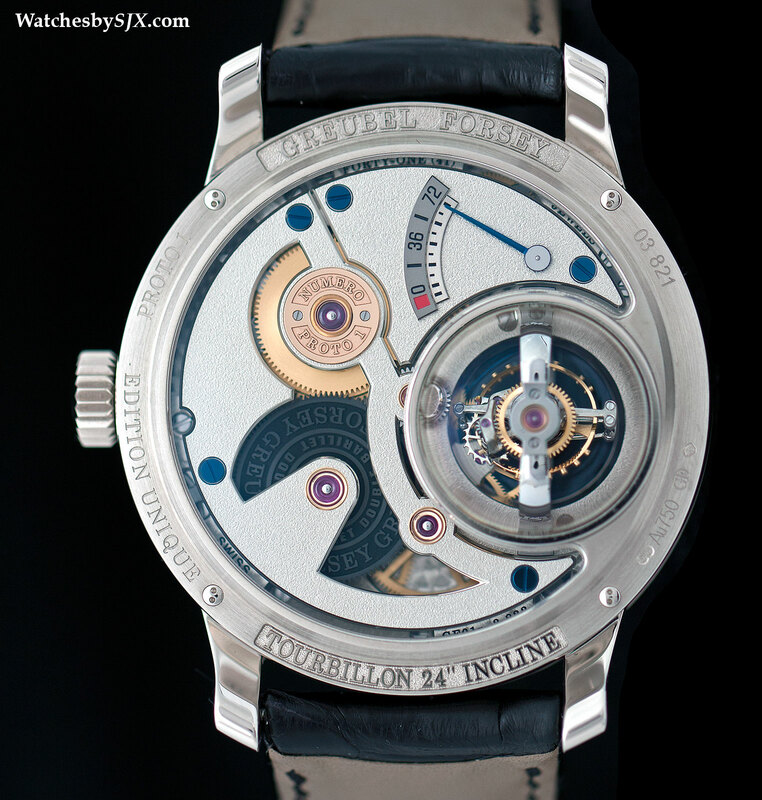 Stacking the complications up into a very slim 5.49 mm high movement, the Rotonde de Cartier Grand Complication is an old school “grand comp” reminiscent of the super complications from the nineties like the IWC Il Destriero Scafusia and Blancpain 1735. 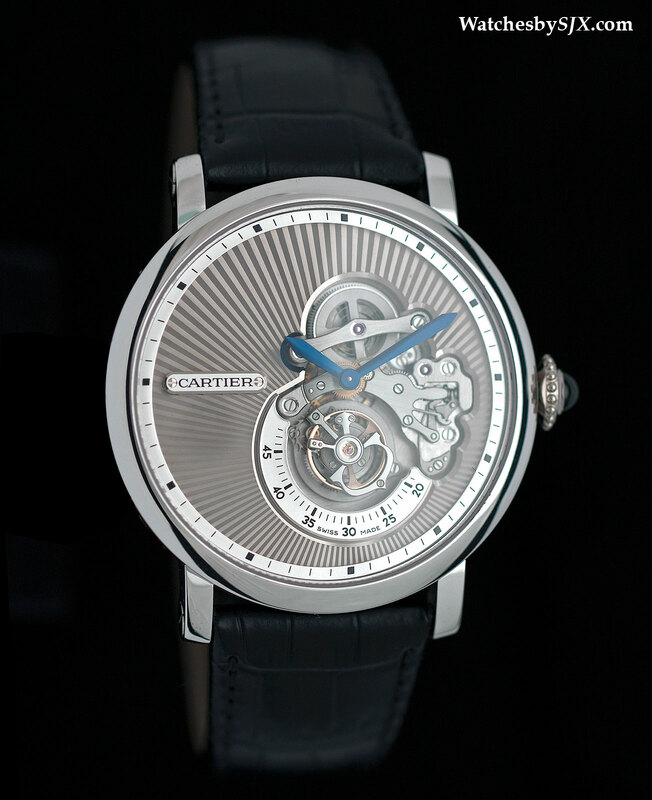 The movement is skeletonised, an aesthetic Carole Forestier, Cartier’s head of technical development, favours. 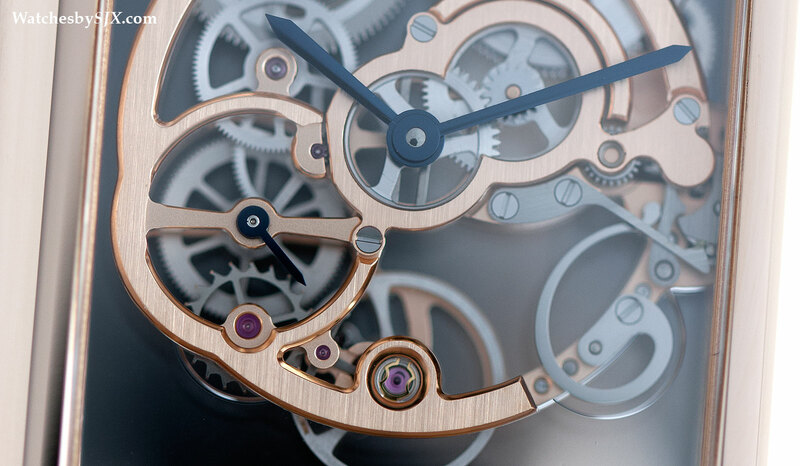 The Breguet hands and the slim case gives the watch an elegant feel, despite the complexity. 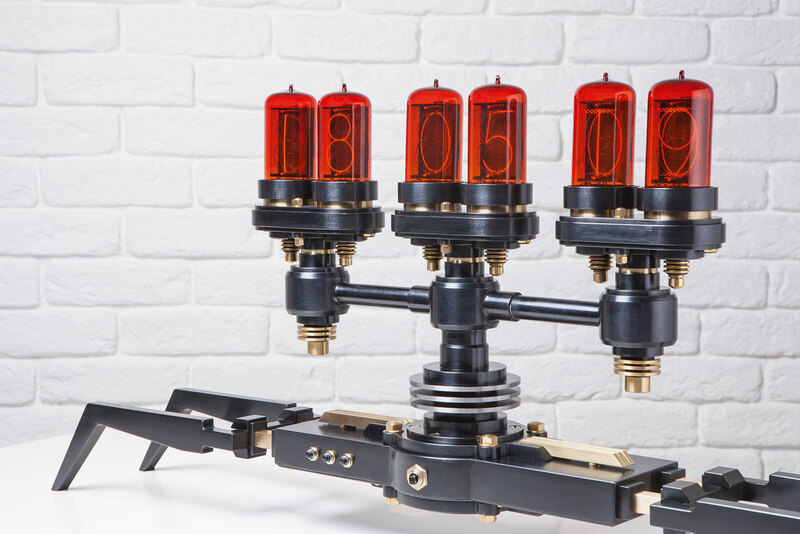 Despite measuring 45 mm in diameter and being in platinum, the case is lightweight, as the interior has been hollowed out to maximise resonance of the striking mechanism. What makes it unusual is the compact winding mechanism, featuring a platinum micro-rotor with an efficient Magic Lever winding mechanism. 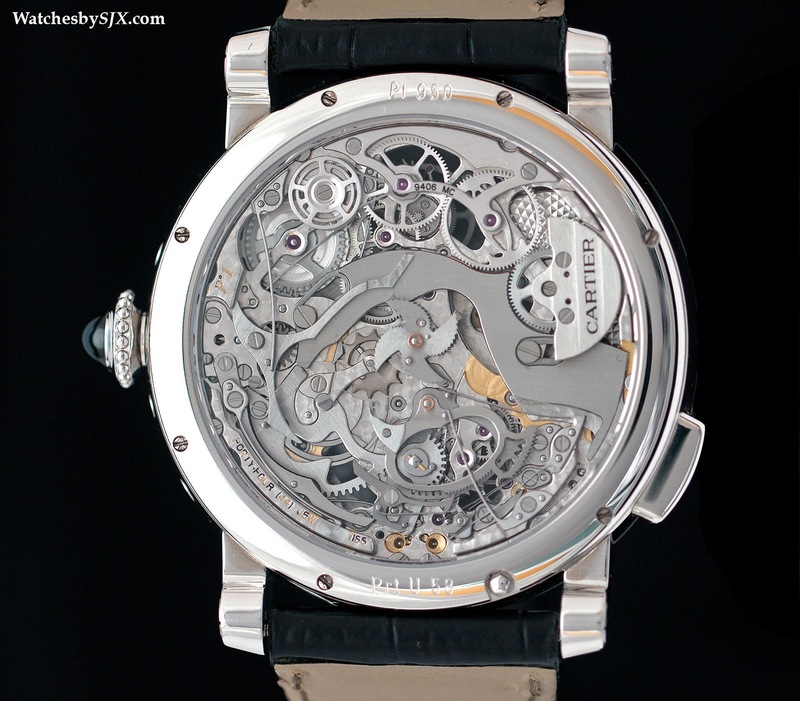 Also part of the Fine Watchmaking line is the Crash Skeleton, which we examined in detail back in December. 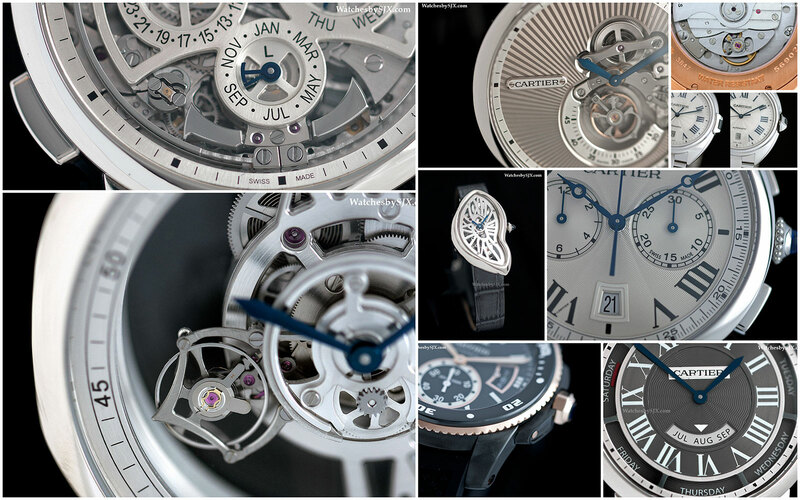 Made in a limited edition of 67 piece, this is a strikingly unusual and beautiful watch. 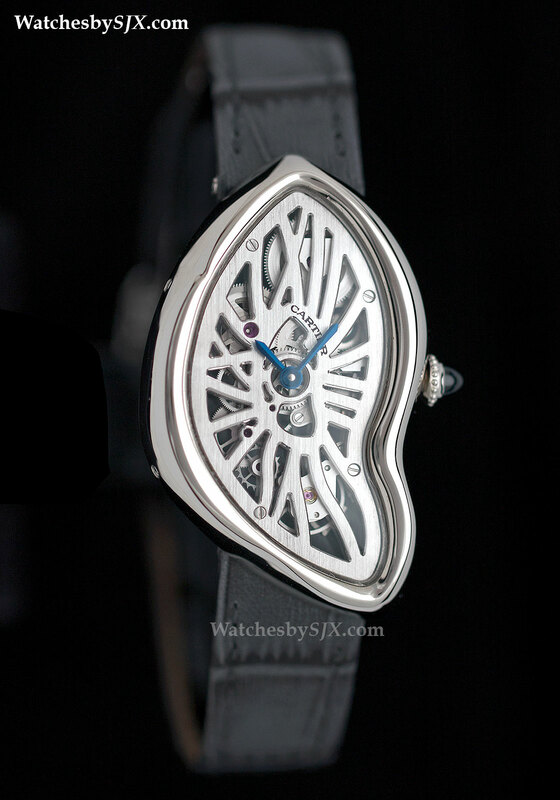 And it’s not just a funky design, the movement was designed to echo the shape of the case. 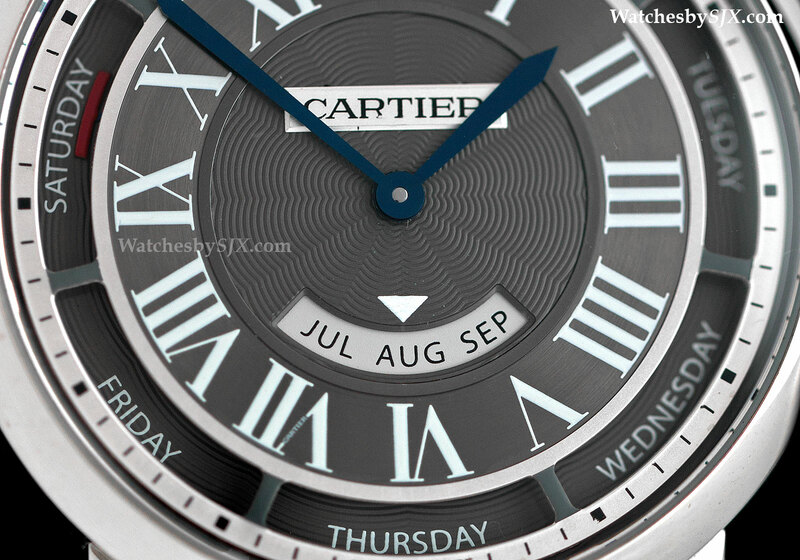 Also previewed here before is the new Rotonde de Cartier Annual Calendar. At 40 mm it’s smaller than its predecessor, with a cleaner dial and slightly smaller price tag, starting at €25,000 in rose gold. 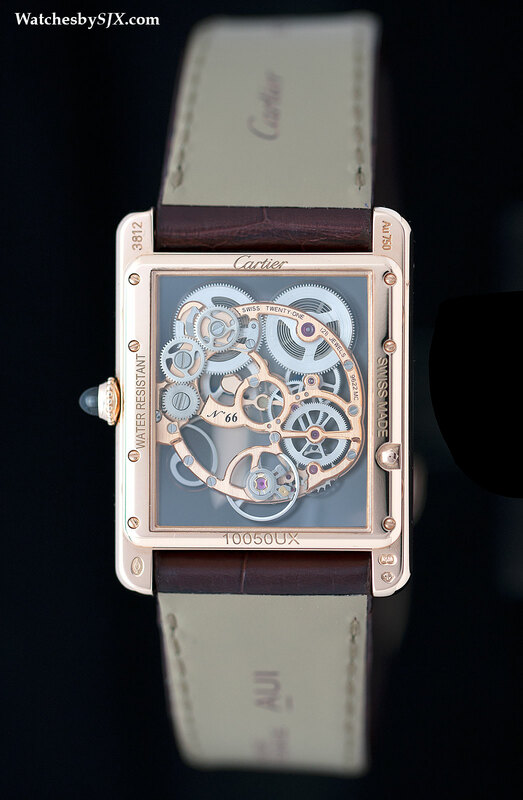 And the Rotonde De Cartier Reversed Tourbillon takes the inverted tourbillon movement developed several years ago and pairs it with a solid gold sun ray guilloche dial. You can read about it in detail right here. 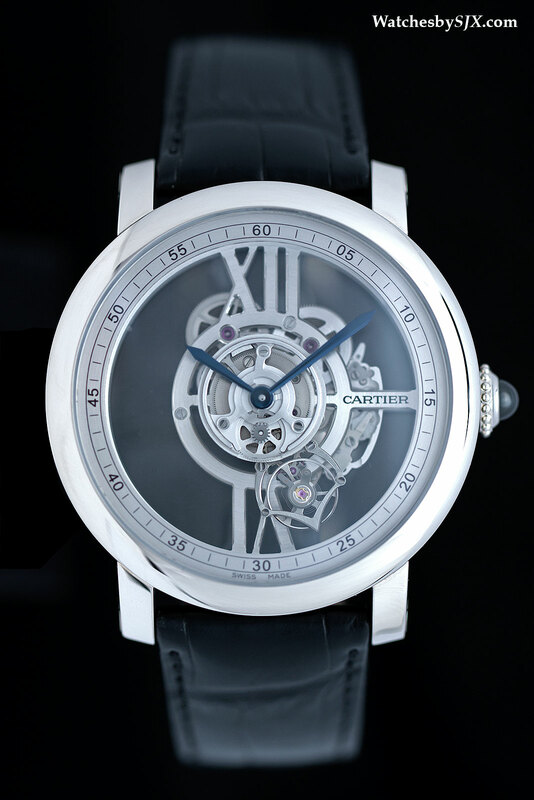 The Astrotourbillon Skeleton is an open-worked version of the central carousel tourbillon developed by Carole Forestier. A barely-there movement anchored by in just three places sits inside an impressively empty 47 mm case – a very dramatic look. 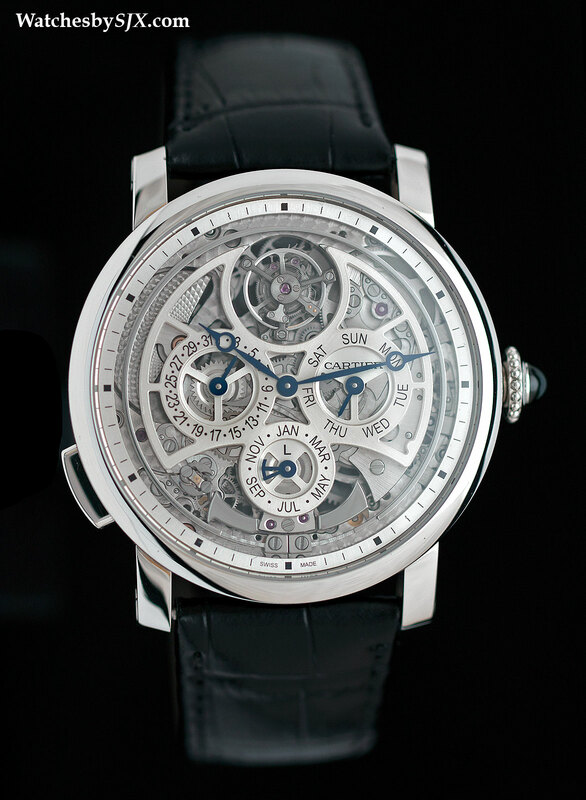 This is a limited edition of 100 pieces in white gold priced at €120,000. 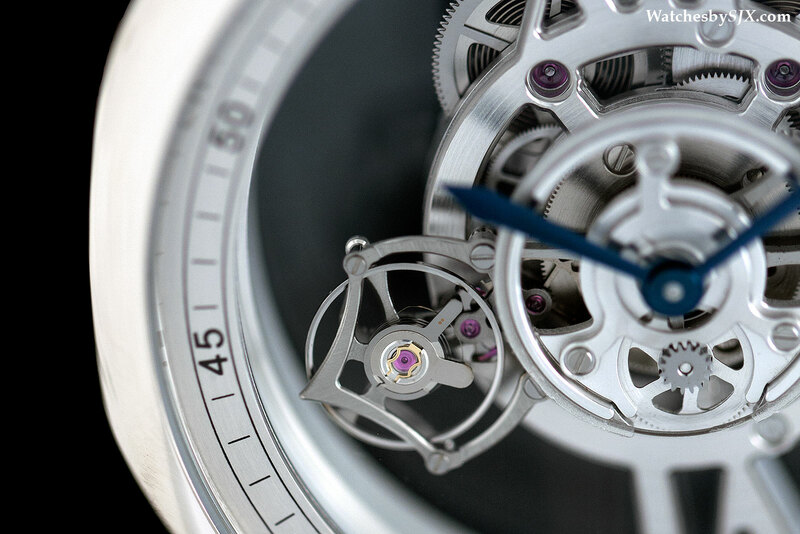 The movement features an enormous, central tourbillon cage that rotates around the dial once a minute. 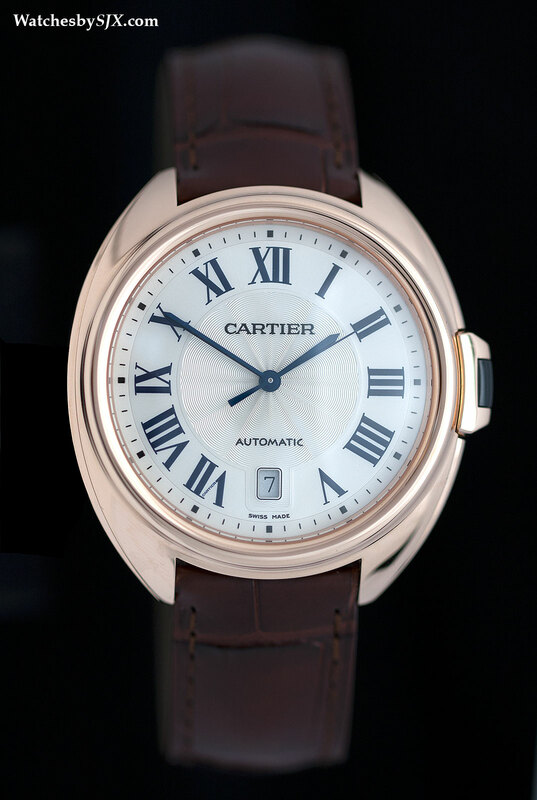 Introduced in white gold last year, the Tank Louis Cartier is now available in rose gold. 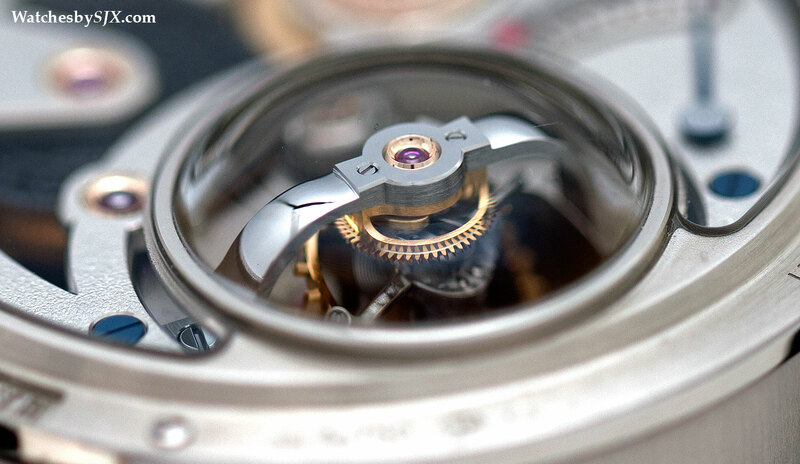 The movement is mounted in a block of clear sapphire secured to the inside of the case by shock absorbers, giving it an uncanny floating effect. 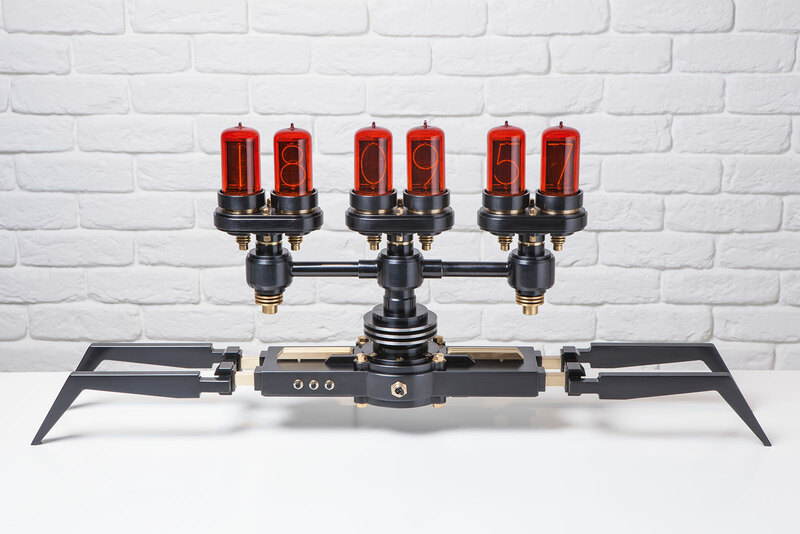 This is priced at €33,500. 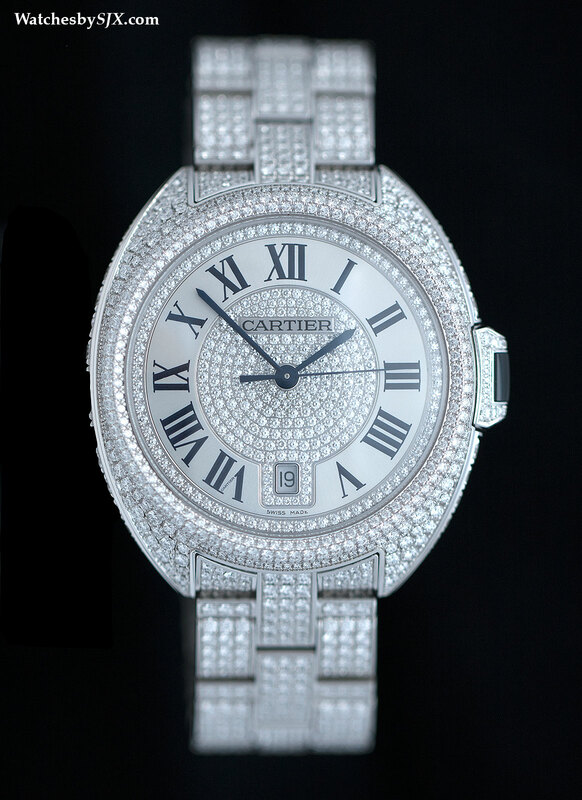 A highlight amongst the jewelled ladies’ timepiece is the charming Rêves de Panthères. 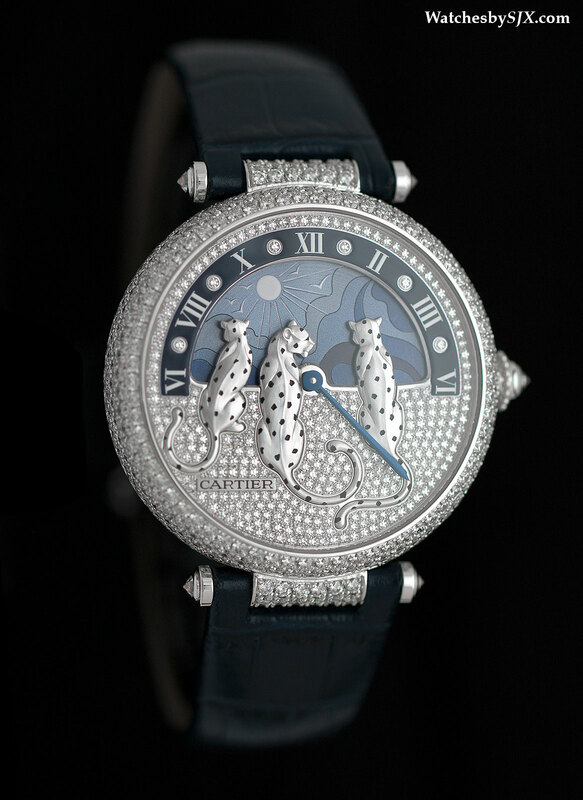 Three seated panthers, backs facing the wearer, gaze at the sun or moon; the hours are shown with a day and night disc, while the minutes are in the centre. 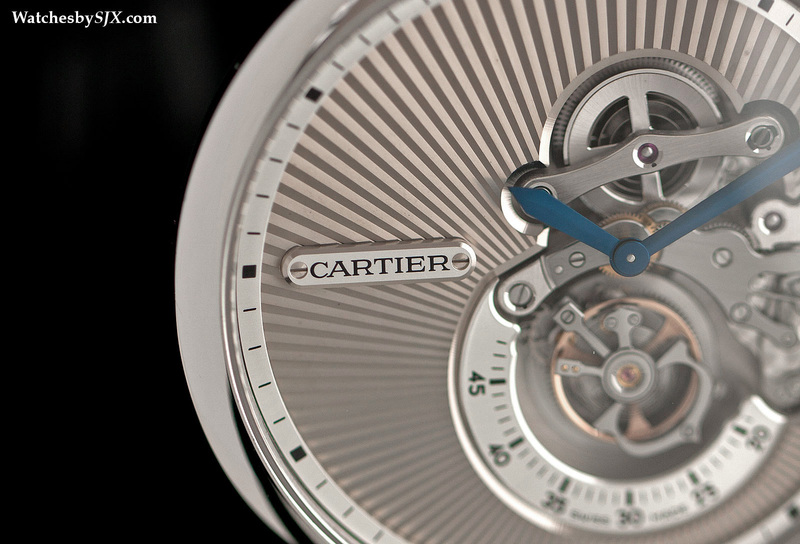 The 9916 MC movement inside is a variant of the calibre introduced last year in the Rotonde de Cartier Day and Night. This will cost €130,000. 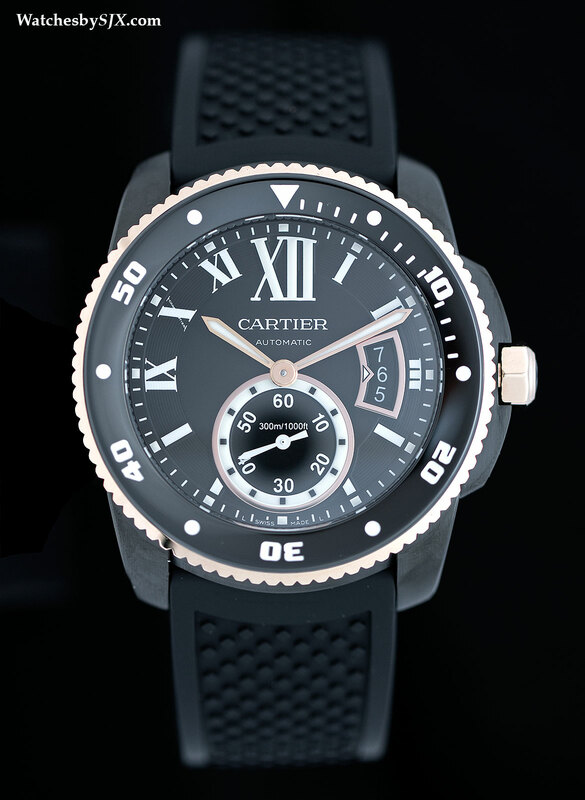 But arguably the brand’s most significant new timepiece sits at the other end of the price range. 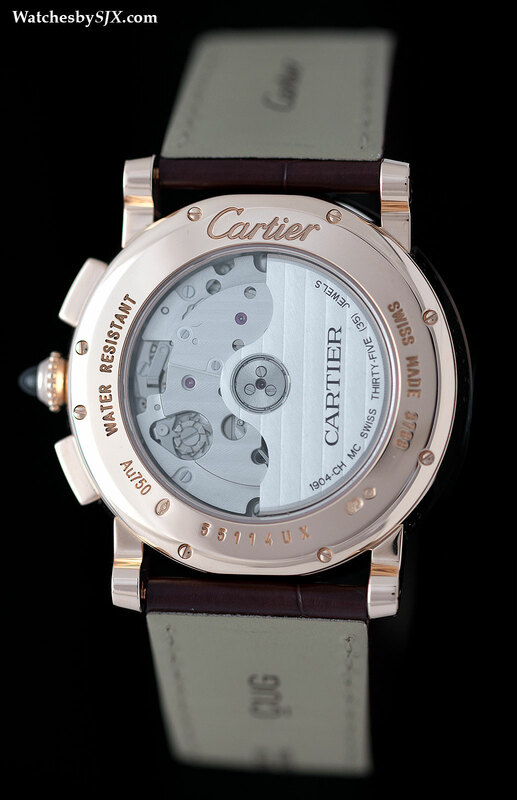 Named the Clé de Cartier (Clé translates as “key”), this is an entirely new case design with a novel crown. 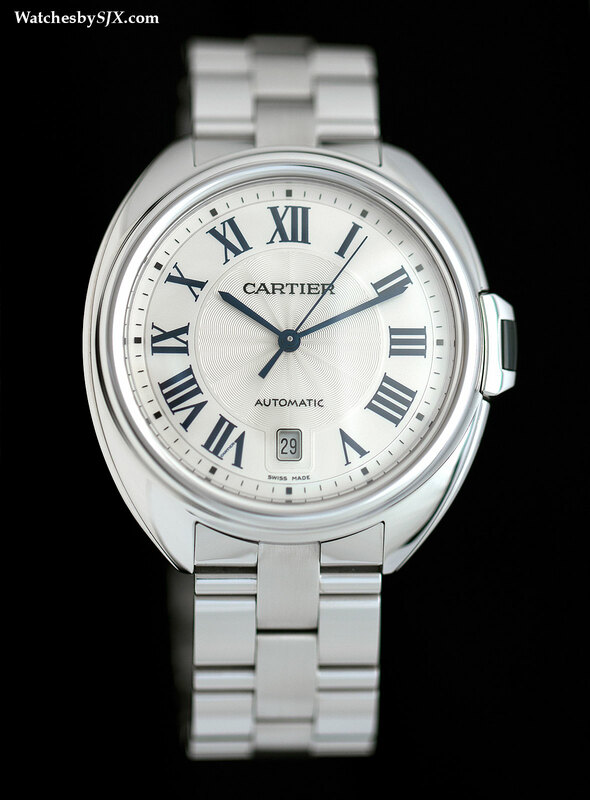 With a cushion-shape similar to that popular in the seventies, the Clé de Cartier has a key-shaped crown that is aligned with the case, inspired by the keys used to wind pocket watches. 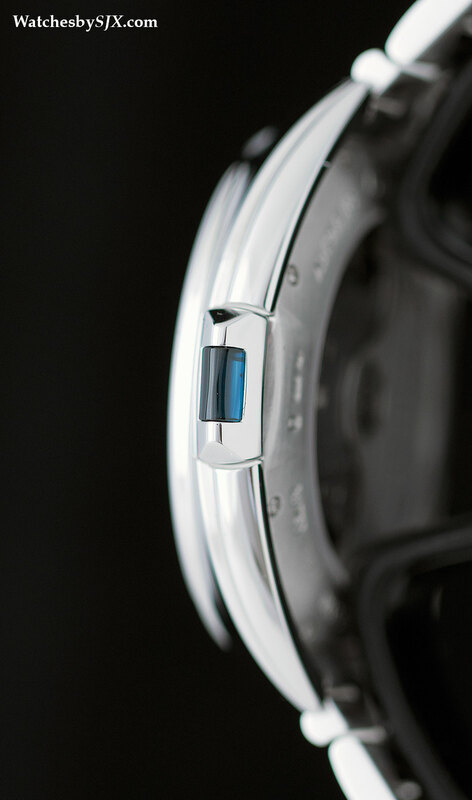 Set with a blue sapphire insert, the crown also contains a spring mechanism that ensures it pops back upright when pushed back in. 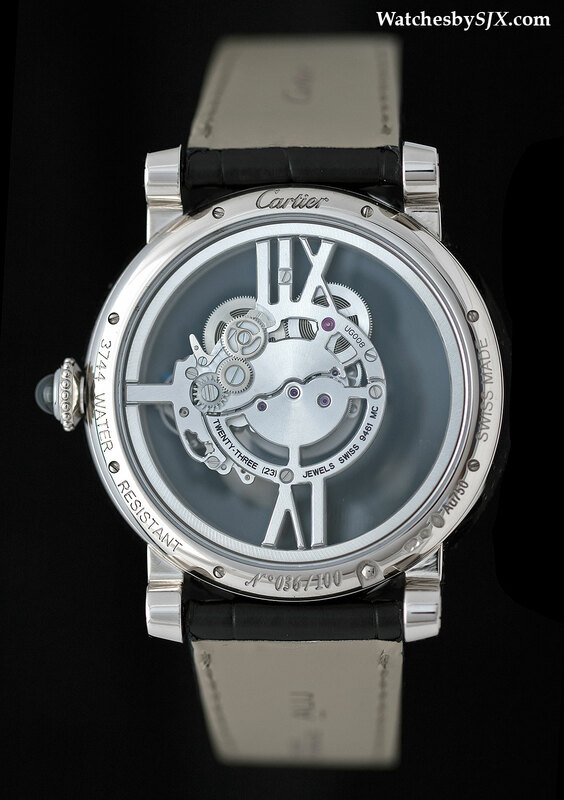 Inside the Clé de Cartier is the 1847 MC movement, used here for the first time. 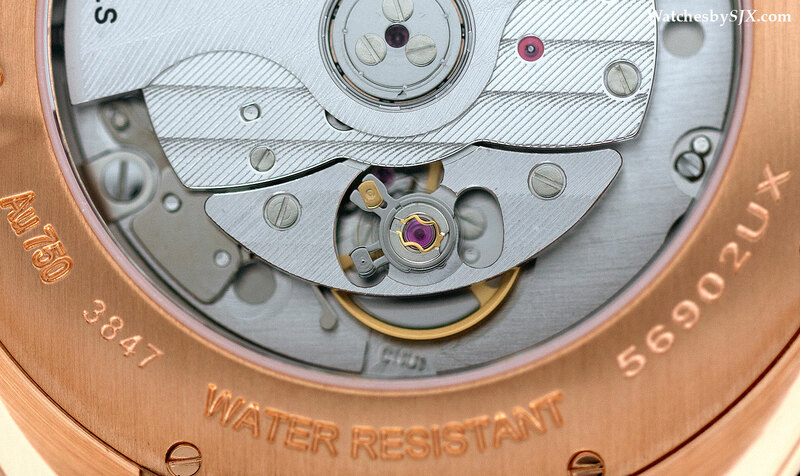 Conceived as a new entry level automatic movement, the 1847 MC is a basic calibre with rudimentary decoration. 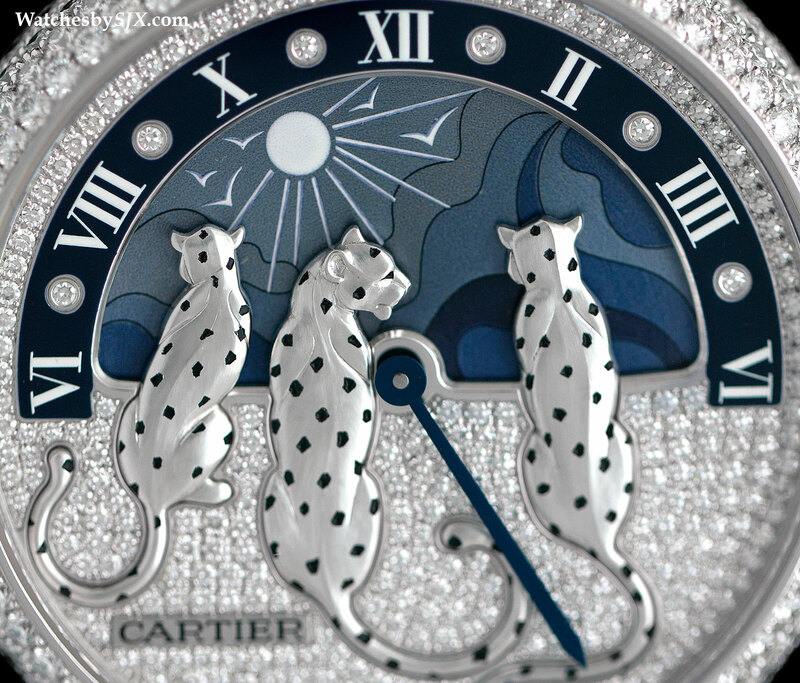 The use of the new movement means the Clé de Cartier costs 15% to 20% less than the equivalent Ballon Bleu models. 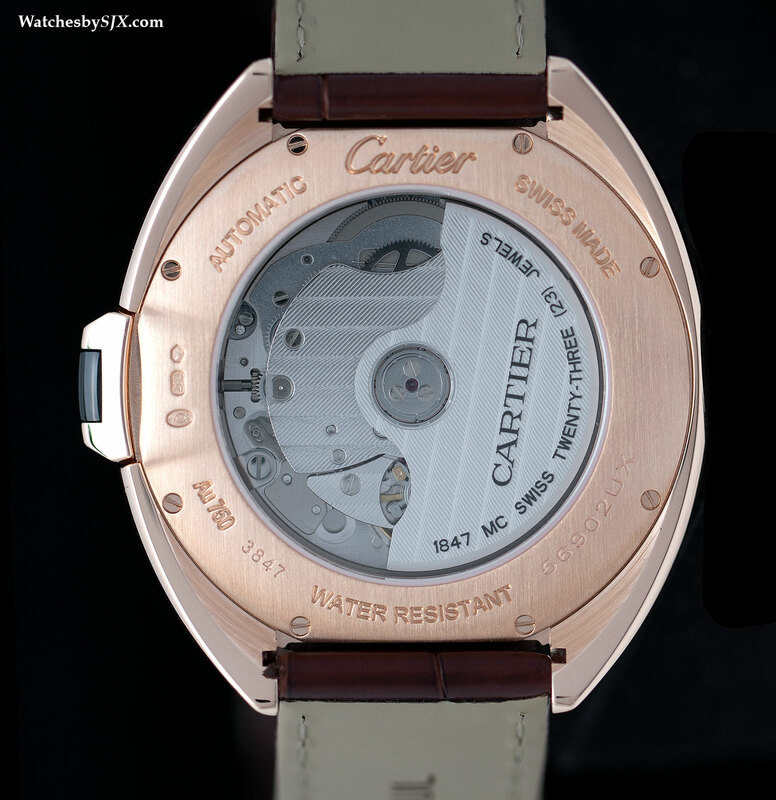 Available in 31 mm, 35 mm and 40 mm versions, in either rose or white gold, the Clé de Cartier will definitely be offered in steel in time to come, and perhaps in a larger case size. 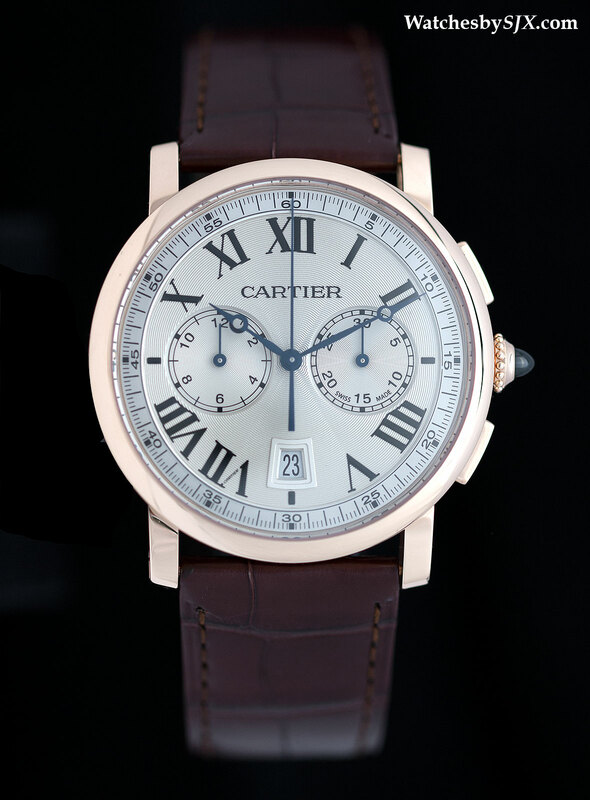 Prices start at €13,760 in rose gold with a crocodile strap, rising to €27,410 for the same with a gold bracelet. 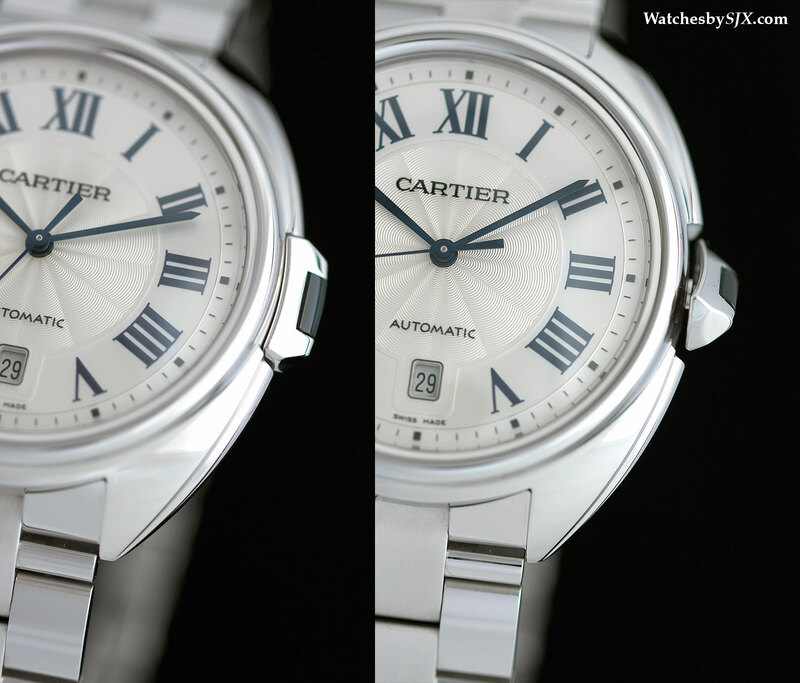 The models with diamond bezels start at €40,740, and the diamond-paved version is €126,000. 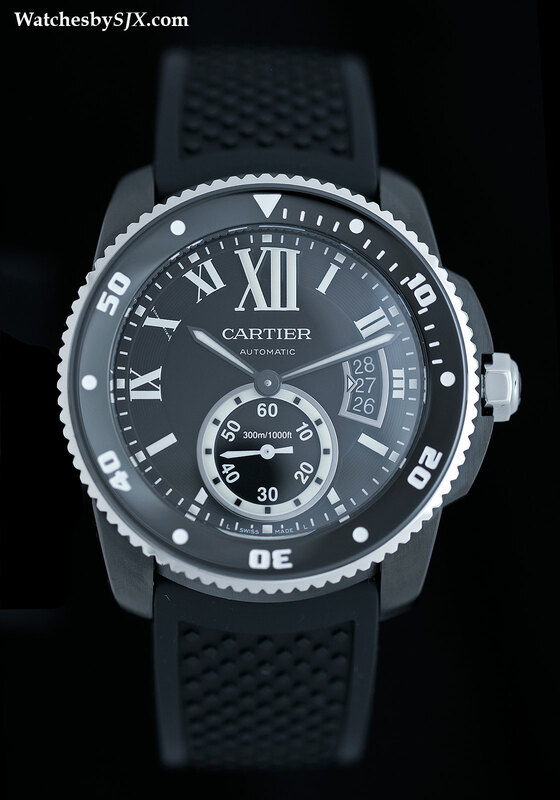 An addition to the successful Calibre de Cartier Diver line are two models with amorphous diamond-like carbon (ADLC) coated cases. One is in steel and the other is steel with rose gold accents. 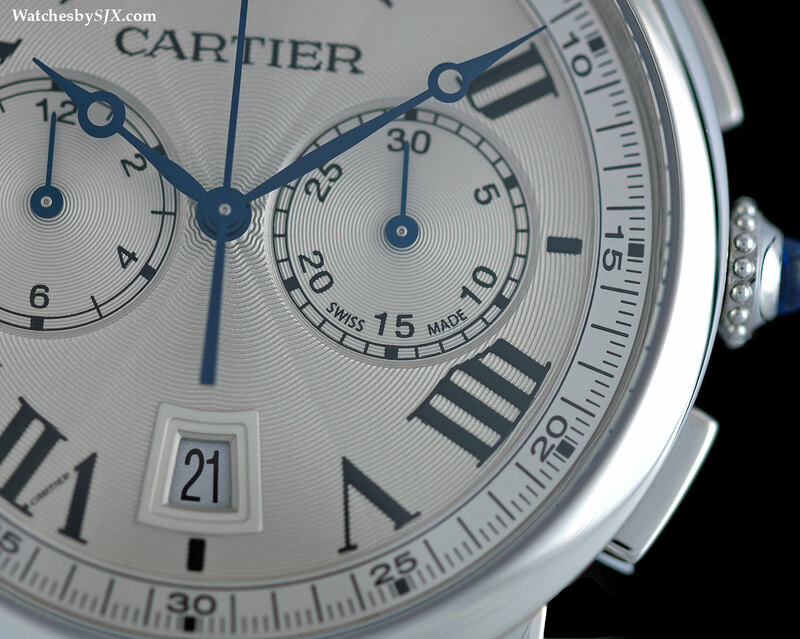 Another relatively affordable timepiece is the new Rotonde de Cartier Chronograph that uses the 1904 CH-MC movement that is now standard in Cartier’s mid-range chronograph watches. 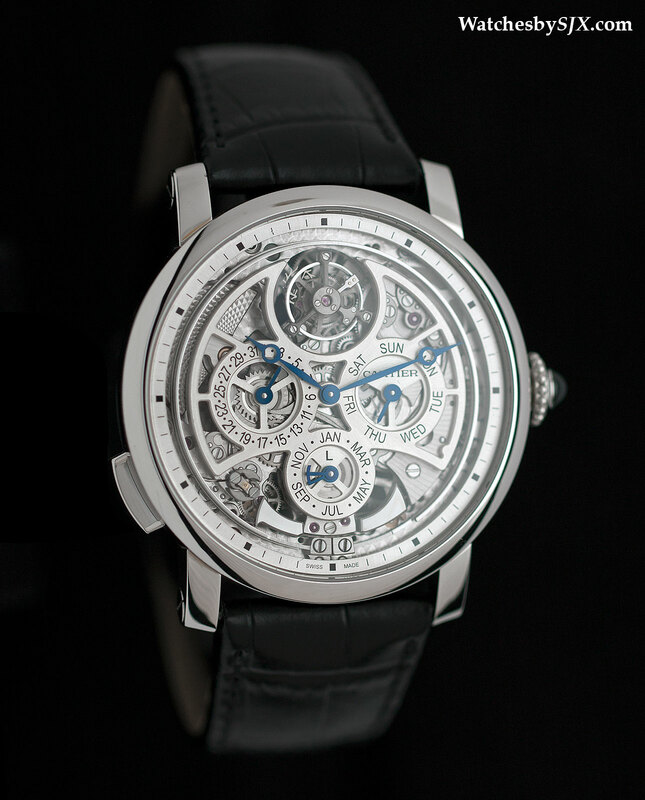 This has a 40 mm case and an attractive symmetrical dial with blued Breguet hands. 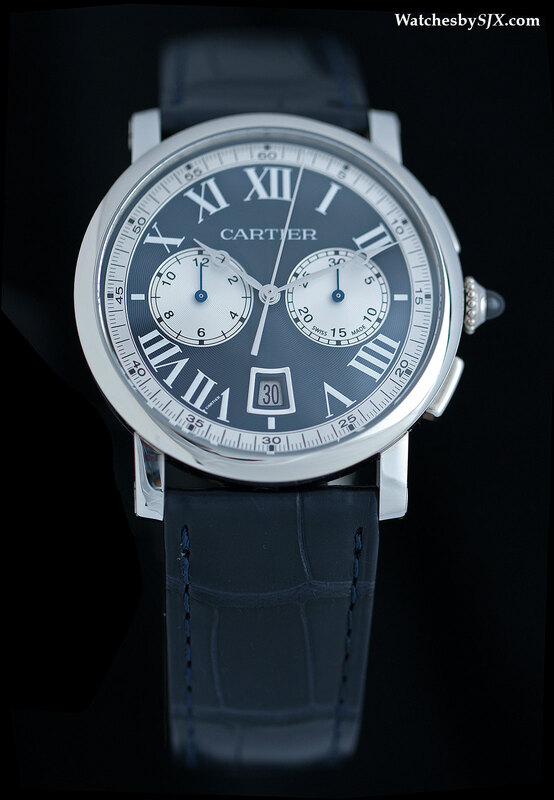 It will be available in rose gold or steel with Cartier’s classic silver dial, as well as a 500 piece limited edition in white gold with a blue dial. 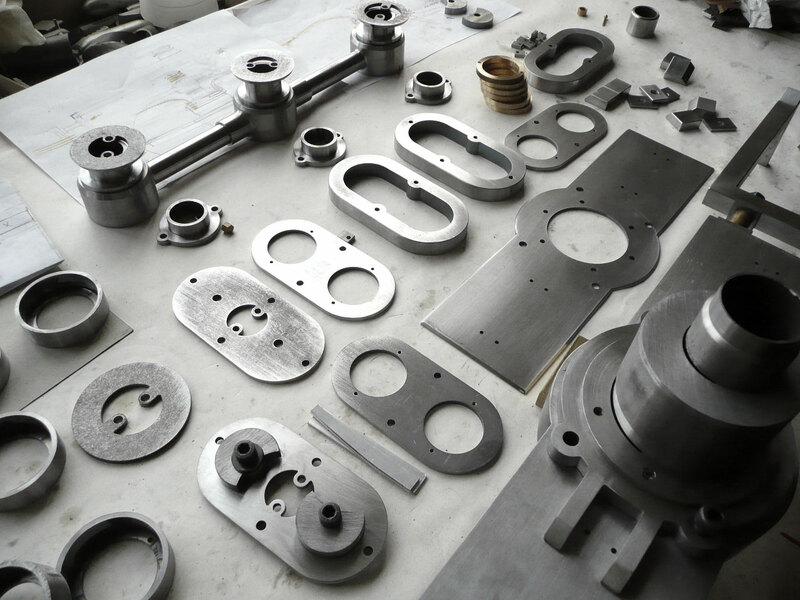 Prices start at 10,000 Swiss francs for the steel model.